Solution: The Vitalize Your Workforce comprehensive strategic change initiative introduces vitality into your organization at all levels. Traces the causes of employee stagnation. Clarifies where stagnation is today, providing specific examples. Illustrates how stagnation inhibits C-Suite ability to effectively lead new strategic initiatives. The Vitalize Your Workforce Book – seeks to turn our Rubik’s cube of understanding about the engagement problem on its head. It provides new paradigm programs and capabilities to halt stagnation in its tracks and build sustainable corporate Vitality. to measure your stagnancy and Vitality, and track your progress towards Vitality Leadership. dedicated to customizing and implementing the Vitalize Your Workforce principles and practices. that facilitate company-wide adoption of fundamental skills requiring increased communication and collaboration. A Vitalized Workforce will understand your Vision and Mission so that it actually means something to them. They will understand the true value of “What’s in it for me?”… while working for you. 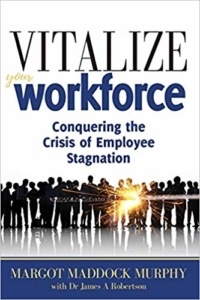 I invite you to join me on this exciting journey as we discuss in detail how to customize Vitalize Your Workforce for your organization and how to unleash the full potential of your workforce – The Vitalize Your Workforce Book . Are you open to 7 new paradigms of thought and action to vitalize your organization?